It’s been a long time since I’ve had the ability to do a Secret Recipe Club post, so I’m really excited to be healed enough and organized enough to be able to participate. This month I was assigned Mrs. Happy Homemaker, a new-to-me blog by Crystal. When Crystal says she’s a happy homemaker, she means it! In addition to three kids and a husband, she currently has 23 pets of the dog, cat, rabbit and chicken variety. Crystal, I’d like to know how you do it. Just reading that on your about-me page made me tired! I browsed Mrs. Happy Homemaker for a good long while – and let me tell you, there’s a lot to choose from. First I thought I might make Crystal’s Twice Baked Stuffed Sweet Potatoes, then I thought maybe I’d make Meatball Lasagna, but all bets were off when I clocked Crystal’s Bite-Size Apple Pies with just 5 ingredients! They’re good hot. They’re good cold. They’re good reheated in the microwave with a dollop of vanilla bean ice cream on top. Crystal is pretty darn genius. The only thing that I did differently to Crystal is to use apple pie spice instead of straight cinnamon. We just happened to have some lying around, and they really brought out that homey, comforting flavor you expect from apple pie. Feel free to use homemade pie crust, and straight cinnamon. When I was making them, I also couldn’t help but think how Nanny would have tucked a small slice of sharp cheddar cheese in each pastry roll. She loved cheddar cheese on her apple pie, and I know she would have loved this recipe. Bring a package of refrigerated pie crust to room temperature. Preheat the oven to 425F. Line a baking sheet with parchment paper. Wash, peel, core and slice apples into chunky wedges. I washed and peeled them and then used an apple corer/slicer combo. Set aside. Roll out the pie crusts. Melt butter in a small bowl. In a separate small bowl, mix together the granulated sugar and apple pie spice. Using a pastry brush or rubber spatula, spread half the melted butter on each pie crust. Sprinkle each pie crust with the sugar-apple pie spice mixture. Using a pizza cutter, slice each round into 5-6 strips, then cut down the middle to make 10-12 smaller strips. 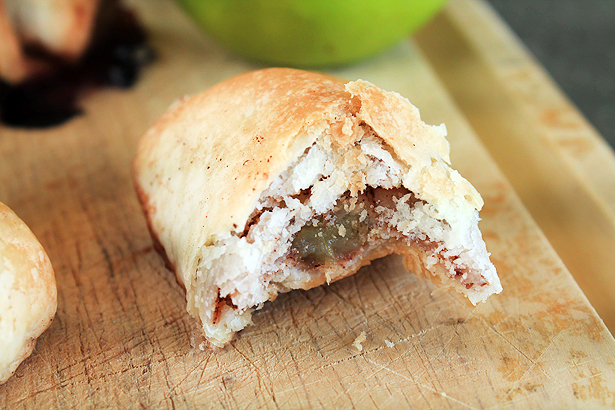 Wrap each apple wedge in pastry, rolling it like croissant around the apple. Place all the wedges on the baking sheet. They should all fit, you don’t need much space between each. Bake for 12-15 minutes or until each bite is golden brown and bubbly. Allow to cool for 5 to 10 minutes, then inhale! 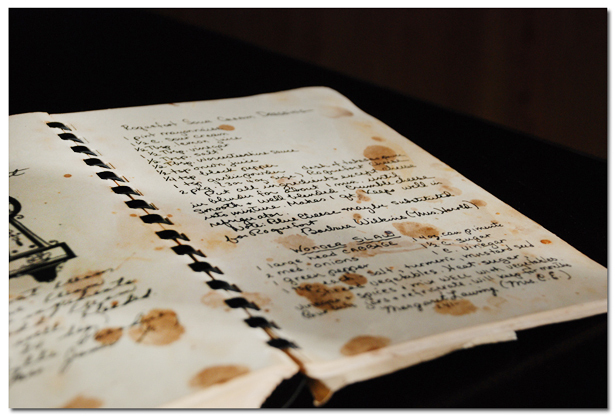 Make sure to visit all the Secret Recipe Club posts! I love this! These look so tasty and are adorable. Oh my, these are so simple and look like a perfect bite. Love your thought of sneaking a bit of cheddar in with the apple. I bet you could also sprinkle the dough with grated cheddar and then roll it into the crust. I absolutely must try these. Delicious and simple. my favorite combo 🙂 great pick! These look delish! I’d be drawn in by how easy they are too! Thanks, Shelby. They really are so easy. I can’t wait to make them again! Love bite sized treats. Apple pie enveloped in pastry sounds divine Amber! These look super yummy, and they’re so cute – a winning combination! 🙂 Yum! I completely agree, Sara. Can’t you see them on a buffet table for Easter? Haha, Susie, you say that.. but we plowed through a plate of these miiiighty quickly. Thanks, Amanda. They were blow your mind good! So glad I got Crystal as my pick. These look like wicked little bites of heaven. I love cute they are and I’m thinking the cheddar cheese addition would be a whole lot of – yum! They are blow your mind good! This sounds like a little bite of heaven! Lovely! Absolutely, Katrina. You’ve got to make them the next time you’re craving apple pie! Um, YES to the cheddar cheese! 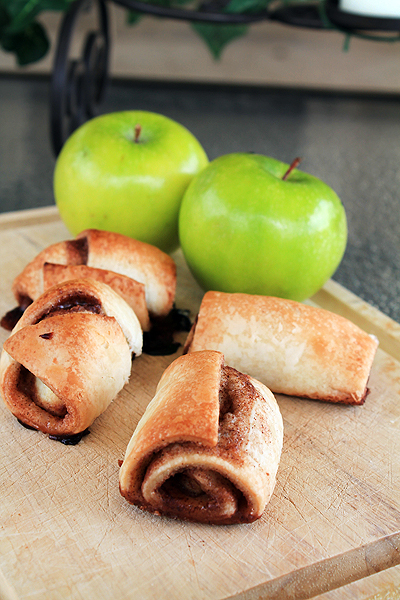 I adore these little pie roll-ups. How smart are they?? So incredibly clever, Casey. And so delicious. This is one of my favorite easy recipes – so glad you chose it! Your pictures are beautiful!! Thanks, Crystal! We really loved the recipe around here. My sister and I were a little embarrassed at how quickly we burned through them! I refer you back to 5 ingredients and the words “apple pie”. How could they possibly NOT be win? !